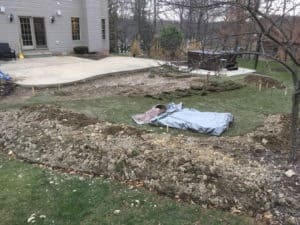 The newest landscape designs include elements such as pergolas, swings, fireside seating, and other components that make your backyard enjoyable. 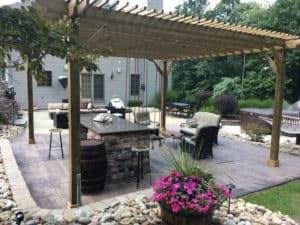 Many of the most inviting outdoor spaces include a patio cover feature to create an outdoor dining area for home or business, poolside shade, or an open-air kitchen. It’s hard to know where to start when incorporating shade covers into a patio design. Freestanding pergola kits offer the average home or business owner a way to easily add a covered area for dining, relaxing, or entertaining. Simply choose the style and size that fits your budget and your space. The most popular pergolas provide a classic yet modern design element to any landscape. What Makes Freestanding Pergola Kits Popular? Free standing pergolas (also known as stand alone pergolas) are top choices of many homeowners and commercial businesses for many reasons. First, they’re one of the easiest ways to create something out of nothing, and build a patio cover that’ll help get the most use out of your backyard. Have a big empty patio space in the middle of your yard? Add a pergola and presto, extra shade, a new outdoor room, and an extra seating area for that fresh air escape. Second, pergolas are an affordable patio design feature that have a timeless feel. If you choose a high quality product like our wood pergola kits, it’s a lasting patio cover you’ll enjoy for many years. Lastly, it’s an easy, multi-use solution to your patio problem! 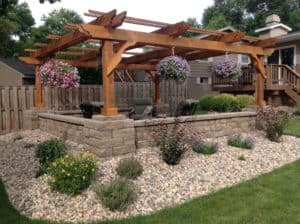 Since there’s a myriad of ways to use a pergola in a patio design, whatever your vision is, you can make it a reality with a pergola. Designing your outdoor space and looking for a way to make your backyard memorable? Make a statement with a pergola. Freestanding pergola kits offer functionality as well as beauty for any patio or garden. 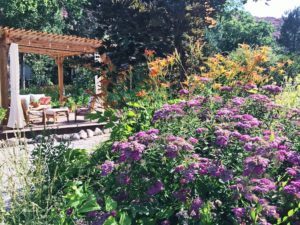 One of the fab 5 uses for pergolas that always appears at the top of popular gardening lists is garden enhancement. Create your own “Garden Room” for your own enjoyment, or your guests. 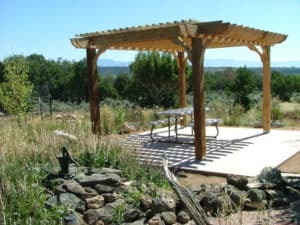 Freestanding pergolas provide a natural structure that blends well with a variety of landscape features. Decorate your patio with a wood pergola on stacked stone or paver bases. Choose a more open design to create a soft airy look for your backyard room. Build some shade and privacy around your pool deck. Freestanding pergola kits add texture and interest to a tropical retreat, and an added privacy wall can make it feel even more like an escape. One of the best views of the big game is in your own comfy chair. 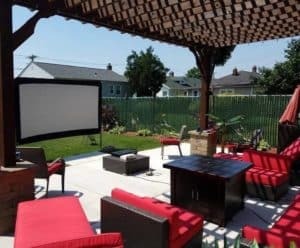 Set up the ultimate movie or sports viewing area covered by one of our Big Kahuna freestanding pergola kits. Offer a new space for your team to hold meetings or take a lunch break. Open air break rooms and picnic areas can be built with a concrete or paver patio and a pergola to provide some welcome shade or cover during any type of weather. So many ways to use a pergola, and now it’s time to put your ideas in motion. This is where the fun begins! So you’ve decided to create a new outdoor room or extend your usable space out your back door. To get started, you’ll need to choose the style and size pergola. First, decide on how much coverage you’ll want and the general design. Then measure your area to determine the overall size. Next you’ll decide on the height of the pergola which will correspond with your post height. Choose your end cuts and you’re another step closer to sitting outside under your very own pergola. Not sure how to build a pergola and wondering how you’ll put it all together? When you purchase one of our freestanding pergola kits (as well as our attached pergola kits), you’ll receive a pergola that arrives pre-cut and pre-drilled with easy to follow instructions. The kit also includes a tools & supplies list and the step by step instructions for how to assemble the pergola components. So, get started and easily grab some extra shade for your outdoor patio with a pergola kit. Build your own outdoor patio cover and spend more time in the fresh air, right in your own backyard! Call us today to help you get started! Got a quick question? Call, email, or fill out our contact form. Pergola Depot (also known as Average Joe’s Pergola Depot) builds and sells affordable, quality pergola kits, serving the United States and Canada since 2008. © Copyright Pergola Depot 2019. All Rights Reserved.